A traditional Edinburgh pub has brought a cask beer back to life just months after it was taken off the market. Drinkers were devastated when Scottish & Newcastle ended a century old tradition by phasing out McEwans cask 80/- ale at the end of 2006. Now, the Athletic Arms is supplying its own exclusive imitation of the famous heavy. The pub contacted micro-breweries in a bid to produce a replacement that was as near to the original as possible. Loanhead-based Stewart Brewing met the challenge, and after weeks of taste testing carried out with the enthusiastic help of locals, it has produced a Diggers version of 80/-. The final product they've come up with is a brand new heavy that is proving as popular as the old McEwan's 80/. 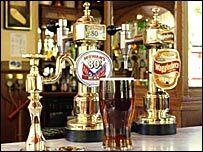 Pub general manager Kevin McGhee said: "We were all very saddened when Scottish & Newcastle decided to stop production of the cask 80/- as it was easily the most popular pint we sold. "We phoned a few breweries to see if they could help us find an alternative and, eventually, Stewart Brewing said they could help us out. "They brought over a few samples of their own beer that they felt would be similar to the old heavy we sold here and we held a tasting session with our regulars. "Our customers all filled out questionnaires about what they thought of the beers and the guys from Stewart made a few changes based on their comments. The final product they've come up with is a brand new heavy that is proving as popular as the old McEwan's 80/." Steve Stewart, manager of the three-year-old micro-brewery, said the beer had already become their biggest seller. He said: "We always try to supply to local pubs and we have around 50 in Edinburgh that we provide guest beers for. "With Diggers 80/- however, we have created a special beer for a single premises, so we're delighted with how well it's going." He said: "We formulated our own 80/- recipe and did a trial at the pub. The feedback we got enabled us to make a few tweaks and give us the finished product. "We're delighted with how popular it has become and really pleased that this beer is now one of our biggest sellers." Former provost, Eric Milligan, a regular in the Diggers on Hearts match days and a self-confessed cask McEwan's 80/- fan, said: "I hope that this new beer is similar to the old Diggers heavy and I certainly look forward to sampling it during my next visit. "The 80/- was a very important part of Edinburgh's heritage, so I am delighted to see that it has been returned to the Athletic Arms."